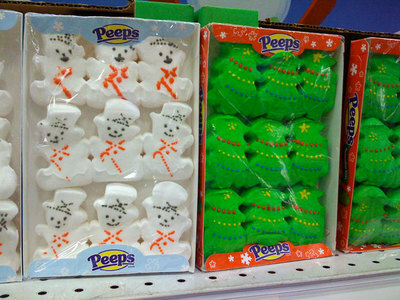 Marshmallow Peeps have now invaded Christmas in the misshapen forms of a snowman and a Christmas tree. I think Peeps are like Candy Corn. They need to be in the right season for me to eat them. While I might tolerate a Chick Peep or two at Easter, they do nothing for me during the holiday season. Oh, and if you click the Peeps link, turn down the volume of your computer to avoid the peppy Peep music on their website. I think Michael Phelps needs to look to dolphins or Aquaman for a challenge in the pool. 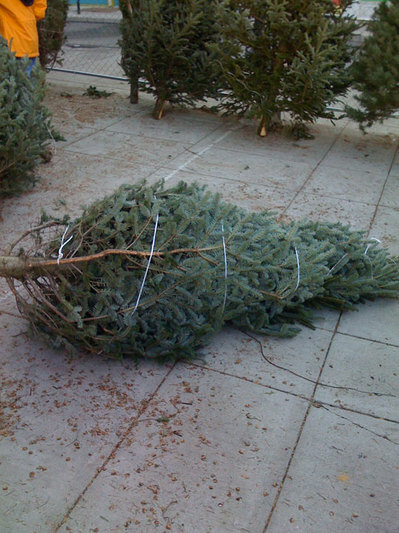 Just bought my Christmas tree at Findlay Market. Nothing like being around a lot of Christmas trees to get you into the holiday spirit. Prices are good, the volunteers are very friendly and helpful and it’s for a good cause. This is the tree that I ended up buying. I’ll post a picture once I have it up and decorated. 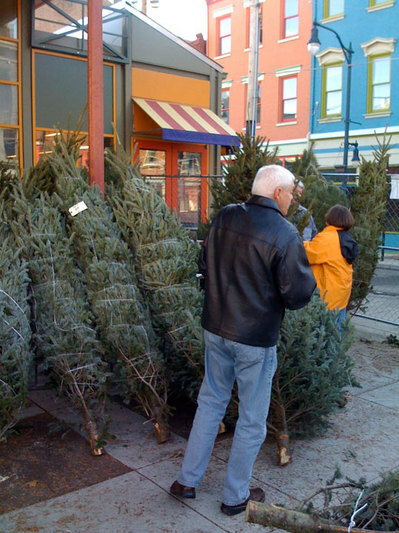 StopAIDS, the greater Cincinnati’s only AIDS service organization providing 26 years of service to the community, will once again sell top quality, freshly cut Ohio Christmas trees and undecorated wreaths at Findlay Market every Saturday and Sunday. The event supports an important local cause and offers shoppers beautiful, long-lasting Christmas trees at a great price. 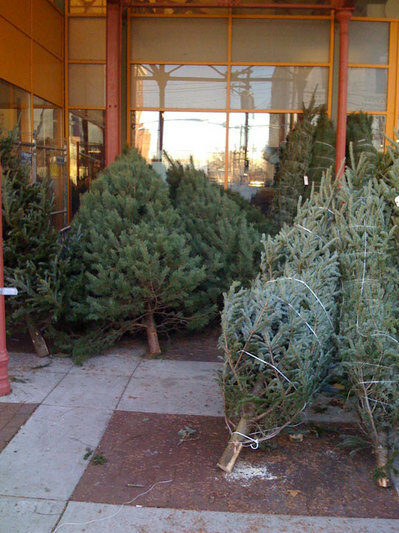 Several varieties of trees and many sizes will be offered. 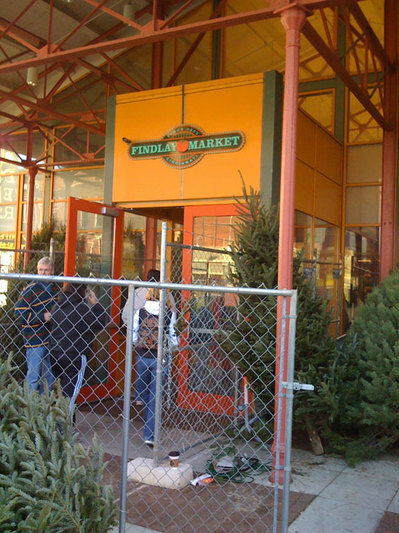 The Christmas tree lot is at the Elm Street entrance to Findlay Market. StopAIDS volunteers will sell trees every weekend until December 21, 2008. 100 percent of the proceeds from the tree sale stay in Cincinnati to provide services to people living with HIV/AIDS and to provide prevention education and testing throughout the area. Trees range in size from 3.5 feet to 10 feet tall. A Wal-Mart employee in suburban New York died after he was trampled by a crush of shoppers who tore down the front doors and thronged into the store early Friday morning, turning the annual rite of post-Thanksgiving bargain hunting into a Hobbesian frenzy. This is sad. The $99 Blu-ray player is not worth trampling someone to death. What is wrong with people? I’m kind of tempted to get one as a Secret Santa present. I’m sure gag gifts represent a huge percentage of their sales. In college a few friends and I decorated the dorm room door of one of the girls on our floor with small gummy bears. If you bite off the back of the bear, the soft innards have kind of a glue-like consistency that allows the bear to stick. 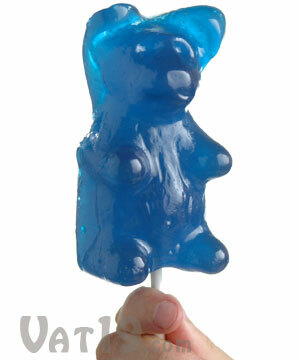 I can imagine what it might look like if we had these super-sized gummy bears. A look into GM and its problems.Â Definitely worth a read. This is an impossible quiz. It’s a little sad that people change their names because their real names aren’t “star” quality. The most hated player in hockey is a women’s fashion buff. Pretty interesting profile of the NHL’s Sean Avery. Avery was punished indefinitely by commissioner Gary Bettman for using a crude term about his former girlfriends now dating other hockey players. Bettman acted within hours, in time to keep Avery out of the Dallas Stars’ game against the Calgary Flames on Tuesday night. “I’m really happy to be back in Calgary; I love Canada,” the Ontario native said. “I just want to comment on how it’s become like a common thing in the NHL for guys to fall in love with my sloppy seconds. I don’t know what that’s about, but enjoy the game tonight.” He then walked out of the locker room.